Mabee Lodge at the Keeter Center on the campus of College of the Ozarks is to say the least unique and beautiful. The combination of its luxury and the rustic design with handmade furnishings make this a destination itself. Situated at the entrance to this unique college with its well maintained landscape the Lodge at Keeter Center will provide you with a stay that you will always remember. Fine dining, historic lodging, and meeting rooms featuring entertainment and products by C of O students all are part of the mix for a wonderful visit. Fifteen beautifully-decorated hotel suites await you only minutes away from Branson’s many famous attractions. The Mabee Lodge at Keeter Center is the perfect place for any event with meeting locations that exude intimate, elegant style, or provide state-of-the-art conference rooms just 10 minutes from the Branson Airport. The Keeter Center at College of the Ozarks is a smoke-free, alcohol-free, pet-free facility, as well as a learning laboratory for the College's educational program, and is operated under the same Vision, Mission, Goals and expectations as the College. Bath features two-person jetted tub and separate shower. Whether it’s a casual lunch, intimate dinner for two or an elegant private dinner party for sixty, our culinary staff of students at Dobyns Dining Room offer something for every taste. Also, your Branson dining experience will be enhanced by student entertainment on Thursday through Saturday evenings from the wide range of musical talent on our campus. For the sweet tooth anytime of the day, our bakery will satisfy any desire with pastries, desserts, homemade ice cream, and a variety of coffee and fruit drinks. For over 100 years, work and agriculture, as well as education, have been important at College of the Ozarks. From its humble farm beginnings and early canning operations to today's student-run farms and student-produced smoked hams and other foods, "Hard Work U," as the College is known, continues to serve the Ozarks in many ways. Keeping with tradition, Dobyns serves only the finest, freshest ingredients available, many of which are grown locally. Our tomatoes, green beans, and some other vegetables are grown in campus gardens in season, by students. Every part of your Dobyns dining experience includes work done by students. 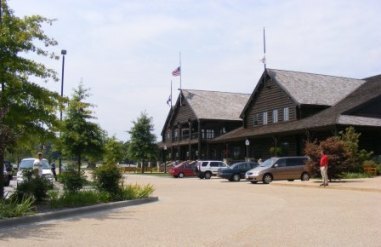 Situated on the picturesque campus of College of the Ozarks, The Keeter Center is an ideal location for any event. Under the expanse of 95,000 square feet, one can find everything from intimate, elegantly-appointed meeting rooms to state-of-the-art conference facilities, all complemented by on-site four-star accommodations and exquisite fine dining.